The tried-and-true Legend of Zelda formula has been delighting fans for decades, but even cleverly crafted puzzles and new enemies can feel a bit too familiar to long-time Hyrule heroes. A Link Between Worlds is not only a Zelda title, it's the sequel to one of the most beloved and highly regarded games of all time - The Legend of Zelda: A Link to the Past. Could this new age outing possibly live up to the nostalgia-inducing quest of the SNES era? 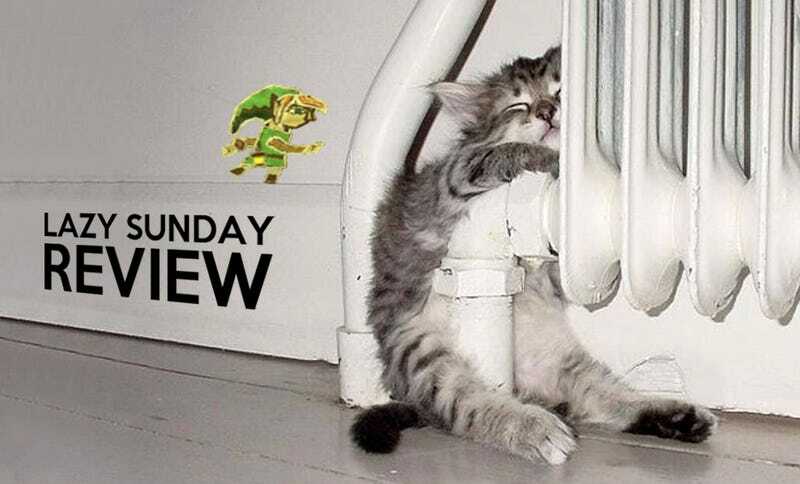 Kick back and warm-up some left overs, it's time for a Lazy Sunday review. - Extremely well thought out puzzles that make you feel like a mastermind when you solve them on the fly. They're not too difficult, but there are enough head-scratchers to make every dungeon a nice challenge. - Becoming a drawing. You would think turning into a "Hyruleglyphic" (Why won't you coin my phrase, Miyamoto?!) wouldn't add much to puzzles or combat, but this ability single-handedly adds a whole new dimension to overall gameplay. - A new take on classic Hyrule. It's like they added a shiny new coat of paint to your childhood... and it's great! - Non-linear questing. The feeling of "do what you want next" is slightly scary at first, but being able to choose your own path means players can mix it up in repeat outings. - Item renting. Being able to pick up almost any weapon right off the bat can certainly be overwhelming, but it also means you can play around with each item (bar one) and test it out on enemies and envirnoments before you put it to good use. - Surviving. While dying is terrible, due to weapon loss, the thrill of making it through dungeons and castles without biting the dust is made all the more enjoyable. - The Magic Meter. No need to collect bombs, arrows, or other power-ups as the newest weapon system condenses them all into one little bar of power. It's nice to have what is essentially an unlimited arsenal of projectiles. - Creative boss battles. Some are new, some are old, and all of these masterful encounters put a nice new spin on taking down big baddies. - Dat box art. Mmm mmm mmm. - Last minute plot twist that may have you reeling. - The art style and character design. They all seemed a little lifeless compred to past Zelda titles, though they both grew on me over time. Wind Waker or Twilight Princess this is not, but it works well enough to make it stand out (in a cutesy sort of way). - Depth perception. As someone who rarely plays with his 3D turned up there were some time when it was hard to make out were exactly I was going to land or if enemies were within range of my sword. Only an occasional annoyance. - Occasional off-putting jaggies (When lines on the screen that should be straight become staggered and jagged). It's hard to keep a series like the Legend of Zelda fresh year after year, but Nintendo has done an amazing job with A Link Between Worlds. The game somehow seamlessly walks the fine line between new and old as it brings a classic Hyrule back to life with some much needed surprises. The non-linear exploration and weapon renting are certainly game changing elements, but the rest of the adventure is so solid that it's hard to put your 3DS down. Far from a cheap imitation, The Legend of Zelda: A Link Between Worlds is truly a masterpiece - worthy of any gamers collection.